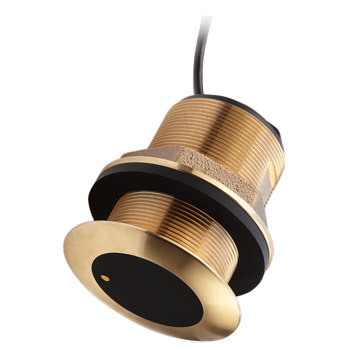 The CPT-S High CHIRP Bronze Thu-Hull Flush Mount transducer is easy to install and offers high resolution sonar imagery and exceptional performance at speed. 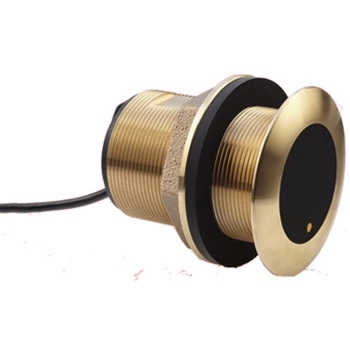 This single element conical CHIRP transducer provides a 25 degree fish targeting beam with a maximum depth range to up 900ft. Compatible with the Axiom RV, Axiom Pro S, and Axiom Pro RVX with the addition of an A80490 adapter cable, this CPT-S transducer is a great add-on. If you are connecting to an MFD that has a CP100 sonar module, installation is plug and play without the need of any additional adapters. This model accommodates hulls with a deadrise of 7-17 degrees. Raymarine's A80490 adapter cable is required for all CPT-S tranducers to connect to an Axiom RV, Axiom Pro S and an Axiom Pro RVX. 9 pin connection from CPT-S transducer will plug into the 25 pin connection on the MFD.